Publisher/Brand : Scale Aviation Mag. This product was added to our database on Monday 4 August 2014. In this book of all new feature articles Alec Smith builds and converts a selection of classic warplanes in 1/72, drawing on the exhaustive Airfix back catalogue to cover iconic subjects like the Spitfire and the Mustang in some interesting and diverse guises, as well as newer toolings depicting classic British jets like the de Havilland Vampire and the Gnat. 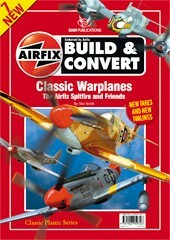 Classic Warplanes Part 1 is a compendium of modelling skills and techniques that will demonstrate to readers how to get the most out of their hobby using basic skills and ideas to adapt and improve readily available ‘pocket money’ kits. Once again, SAM Publications has drawn on the talents and enthusiasm of its team of contributors to demonstrate ‘what you can do’.